The ART Tube MP Studio V3 Mic Preamp is a single-channel microphone preamplifier that features ART's revolutionary Variable Valve Voicing technology. The ART Tube V3 provides optimised reference points which have been created and fine-tuned by some of the industry's top studio and live-sound engineers. 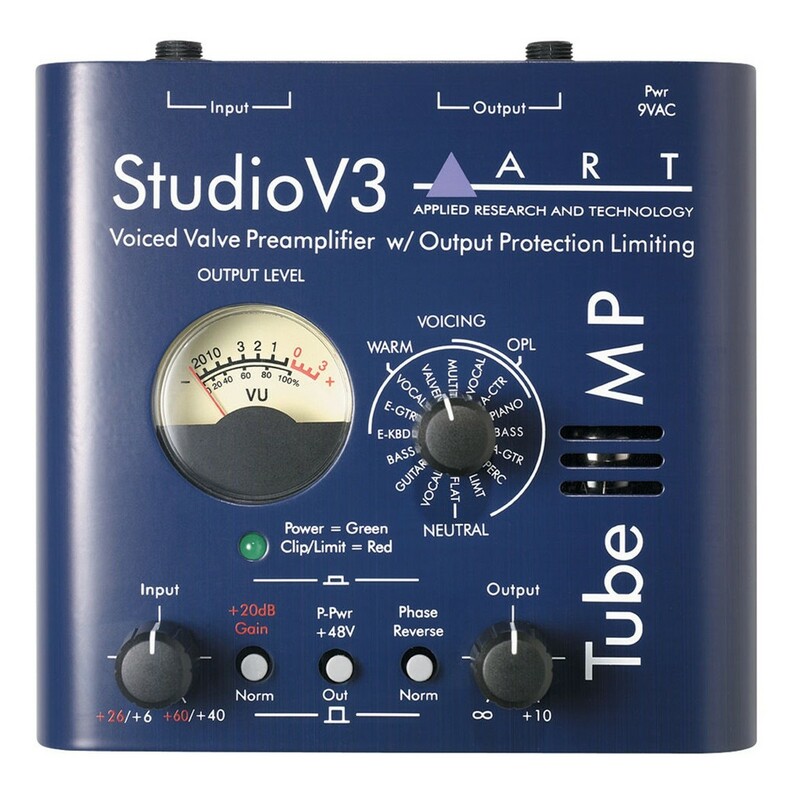 Additionally, the ART Studio V3 is suitable for use with various instruments and line level devices. Complete with an Output Protection Limiter which precisely and accurately maintains the output signal, the ART Tube MP Studio V3 Preamp is perfect for adding warmth and character to your recordings. V3 provides an optimized reference points to begin the recording process. The V3 presets were created and fine-tuned by some of the industry's top studio and live-sound engineers, along with our veteran engineering department. V3 allows you to select between a multitude of preamp settings designed for guitars (electric and acoustic), keyboards, bass guitars, drums, vocals and more. V3 gives you incredible presets for every instrument you record, so all your recordings will sound professional. Need to tweak the presets? Go right ahead -- hone your perfect tone! That's the power of V3. V3 also incorporates ART's OPL (Output Protection Limiter), which precisely and accurately controls and maintains the output peak signal. The OPL circuitry is crucial in protecting the next link in a signal chain - such as a hard-disk recording system or a sound card. While it's primary application is to be used with a microphone, the Tube MP Studio V3 can also function as a direct box - impedance matching, amplifying and improving the sound of any instrument plugged into it. The design of the Tube MP Studio V3 allows it to add warmth and fatness to a signal while maintaining low-noise. Whether you're working with a computer, hard-disk, or digital multitrack recorder, the Tube MP Studio V3 s design delivers professional recording studio results at a fraction of the cost of comparable equipment. The Tube MP Studio V3 offers superior performance and sound quality to the "on-board" preamps found in today's low-cost mixers and multi-trackers. Professional quality sound combined with professional features - a hand-selected 12AX7a Tube, Phantom Power and Phase Reverse - are what make the Tube MP Studio V3 an outstanding microphone preamp. 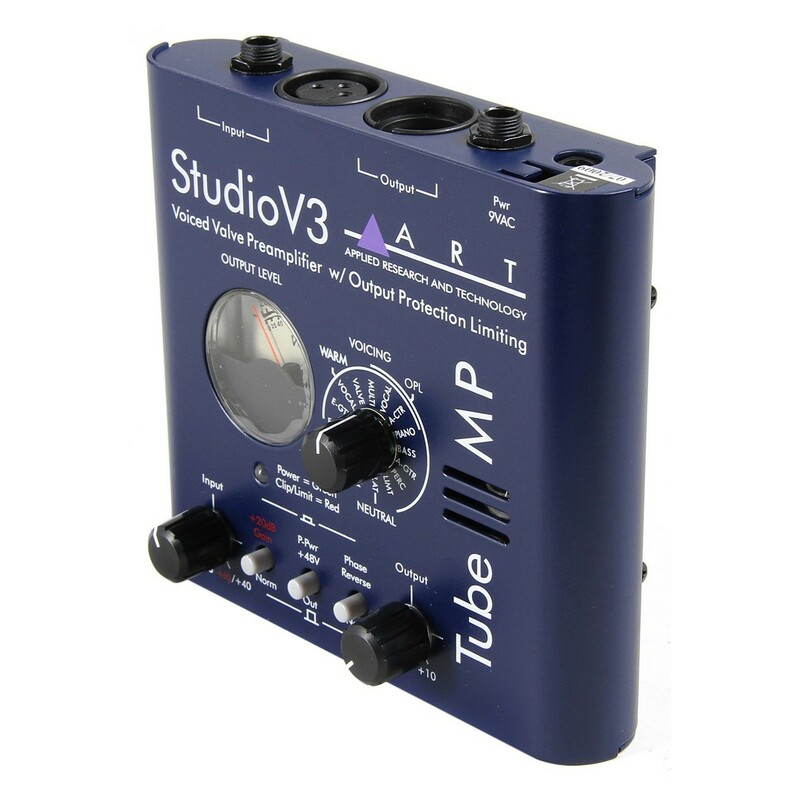 The Tube MP Studio V3 can be used in a wide variety of applications including recording, project and home studios, where it s Variable Valve Voicing really shines. It also functions as a direct box, with impedance matching and preamplification for line-level sources.